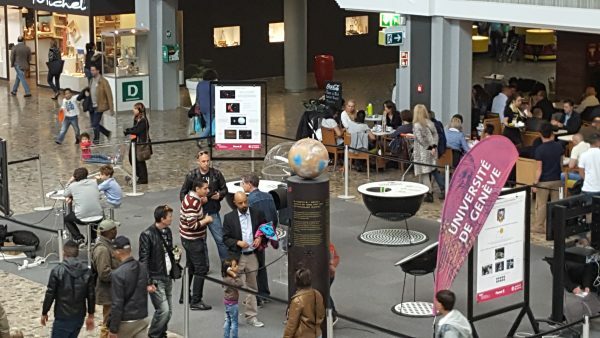 As soon as the pillar about exoplanets has been set up in the lobby of the planetarium of the Swiss Museum of Transport in Lucerne, people are gathering. They want to know what there is to see. They are especially attracted by the rotating planet on top of the pillar. Around the planet there is an orbiting model of the ESA Space Telescope CHEOPS, which is being built under Swiss lead. The children want to catch a glimpse of the 3D photos that can be seen in two side-mounted stereo viewers. And the adults read the texts and watch one of the video clips on the screen. The pillars are obviously a big attraction; the flyers in the dispenser are popular. 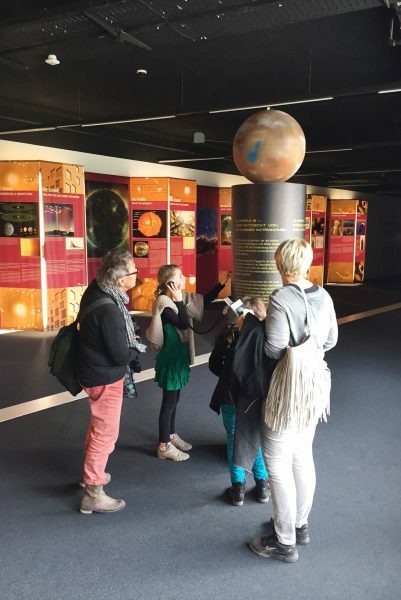 The first exoplanet pillar was set up in March at the Naturama in Aarau. On the same day Prof. Christoph Mordasini from NCCR Planets gave a lecture on the discovery and exploration of exoplanets to an enthusiastic audience. At the museum focusTerra ETH Zurich, near the meteorite exhibition, the pillar is immediately apparent. And in the cafeteria at the Swiss Space Office in State Secretariat for Education, Research and Innovation in Bern the pillar pulls the attention of the visitors. In Geneva, the PlanetS pillars were presented for the first time at an exhibition in Balexert shopping centre. From the 9th May, day of the transit of Mercury, until the 21st May, the shopping centre customers could discover the world of exoplanets, as well as a model of CHEOPS and they could also explore the PlanetS pillars animations. The pillars played the role of a magnet with the public who did not always dare to approach. They also proved to be very strong and reliable, in fact, children who were particularly attracted to these pillars did not hesitate to step on the audio cables, to cling to the image viewer when they did not fight to press the button for the video of their choice. The pillars also helped to attract the curiosity of passers by as most of them first looked at them before turning to the two members of the NCCR that were present. This was an experience that should be repeated during the open-house day of the Geneva Observatory on 2nd July, as two PlanetS pillars will be displayed to the public.